The Nature's Generator Power Transfer Gold Kit is a great introductory package that allows you to start generating and storing your own power even if it's something you haven't done before. With the addition of the Power Transfer Kit, you'll be able to continue providing power to your most needed items without having to disconnect them from their current outlets. By installing the Power Transfer Kit you'll be able to link the existing power circuits in your indoor breaker panel to your Nature's Generator Gold System. • Features Central LCD display for easy to read system information. • Universal heavy duty cart included and designed to work with nature's generator, nature's power pod or both. 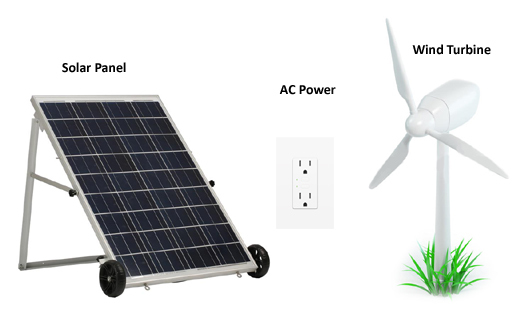 • Features built in 150W solar charge controller and port, along with a 300-Watt wind generator charge controller and port. • The Built-in 600-Volt/175 Amp expansion port allows connecting an unlimited amount of nature's power pods. The expansion capabilities are endless! • The included Natures Generator Power Transfer Kit allows the user to feed power directly to select outlets in your home! No more moving around heavy appliances or running extension cables! • Add an additional 100 Watt Solar Panel for twice the recharge power! • The Nature's Power Expansion Pod is easy to use, install and expand infinitely with your power needs! Turn your portable weekend getaway back up generator into your own personal Power Plant! Features 100 AH of extra storage capacity per Power Pod! 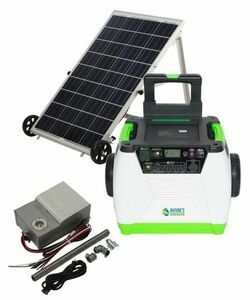 Natures Generator Portable 1800-Watt Solar Generator can be charged by connecting the included 100 Watt Solar Panel. Natures Generator Portable 1800-Watt Solar Generator - Gold Kit can be recharged from a regular wall outlet. Gain the capability to check the battery level of your unit directly from your phone! Provides you with historical information including the amount of power you�ve consumed, battery voltage, and recharge data from either of the three recharge methods. By syncing your unit with the Nature's Pulse app, you'll have the ability to allow us visibility into your unit. This will allow us to provide easy and fast troubleshooting and technical support. Dimensions: 8" � 4.75" � 13.25" in. The Nature's Power Pod can be used independently or in conjunction with The Nature's Generator. It features an internal 100Ah Sealed Lead Acid battery that can be recharged through the solar panel input on the front of the unit. Features an LED light fuel gauge to let you know the units level of charge, along with a 12V DC output port. The Nature's Power Panel provides up to 100 Watts of recharging power. This poly-crystalline solar panel is reinforced with 3.2mm safety and anti-reflective glass. It includes summer and winter positions for optimum exposure during the various seasons in the year. For ease of use and transportation, the solar panel includes wheels and a lightweight anodized aluminum frame. The Nature's Generator Wind Turbine has been designed and made specifically for use with the Nature's Generator. The Nature's Generator Wind Turbine will allow you to harness the power of wind and provide you an additional method of charging your Nature's Generator. The high quality cast aluminum alloy body provides protection from natural elements and its sturdy design provide versatile use on land, water or wherever you decide to install the wind turbine. If you only have the Nature's Generator or Nature's Power Pod and are looking to expand your system by adding a Nature's Power Panel, don't forget to get this 50Ft Solar Panel cable. This cable will be needed to connect your Nature's Power Panel to the Nature's Generator or Nature's Power Panel. The fantastically versatile Dometic TC 21 thermoelectric cooler offers superb cooling and warming performance. It's the ideal size for couples on a day out, giving users the flexibility to take hot or cold refreshments with them, to be consumed at the ideal serving temperature later that day. A sturdy carry handle and lightweight design ensure convenient portability as you find your perfect picnic spot. 1 )How long the batteries of this 1800-watt solar generator will last from the date of purchase until they need to be replaced? 2 )How many months/years is the guarantee from the date of purchase? 3 Will I have to order the replacement batteries from your company? If so; Are future replacements included in the purchase of the generator? 4) How much each replacement will cost If replacements aren't included? 1. The batteries will typically need to be replaced after 3-5 years. 2. This kit includes a 1 Year Manufacturer Warranty. 3. The replacement batteries can be purchased by contacting us directly at 877-548-3387. Replacement batteries are not included with purchase. 4. The replacement batteries are currently $149.99. Thank you for your inquiry! 1800 Watt Solar Generator Complete with (2) 100 AH Batteries & 160 Watts of Solar - For Homes, Cabins and More! 1800 Watt Solar Generator for Homes, Cabins and More!